In June 1958, Jule and I hitched a 4 x 8-foot rental trailer to the Chevy and drove it fully loaded all the way to St. Petersburg, Florida. We didn't have any problem except once when the trailer whip lashed on us because a motorist cut us off. But I was able to slow down instantly and straighten out the trailer. When we arrived in Jacksonville, we were exhausted. It was a long trip and it was a relief to be in Florida. Thank God we had made it that far. We were anxious to see our new home, so we continued on the 250 miles to St. Petersburg. Finally we arrived at Kenneth City, and there was our brand new house. We were speechless. The best part of the trip was inserting the key into the door of our first house. It was brand new and clean. It smelled clean. Everything was immaculate, the floors, the windows, the doors. Even the terrazzo floors were cleaned and polished. We were very happy. 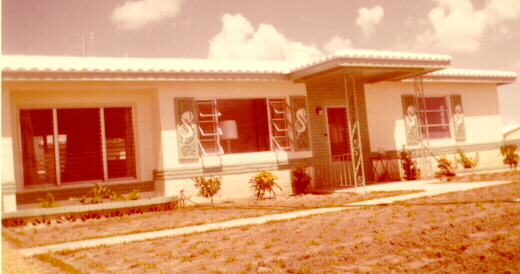 It was a great thrill because it was the very first home we had purchased and it was brand new. Just to be notified that it was ready for occupancy and moving down to Florida was just about the greatest thrill for both of us, and our boys. It was an experience we will never forget. Just the feeling of pulling up in your very own driveway. Looking at your new home clean as a whistle, both inside and outside. Just waiting to take over and enjoy. You just have to live it to feel it. It was amazing. Clean windows, clean floors, everything clean. Our first duty, as requested by the builder, was to check everything and make sure that there were no defects. If we found any, we had to notify them within a year and file a correction report. We looked but could not find any defects. Believe me, I looked, but everything was perfect. One of the first things we had to do with our new house was to make arrangements to install a new lawn and have some shrubbery planted. Every week we would purchase some plant or a tree, and always at "Doc Webb's," because they had the best buys. I once bought a water hose at Webb's which had a 15 or 20- year warranty, and I used that hose for over 25 years. I finally had to replace it because it was drying up and stiffening and getting impossible to bend. I joked to the salespeople in Webb's that I could not return it on the warranty because I had lost the sales receipt. I just recently purchased a new hose and it works out pretty well. Sidney Colen was the developer and builder of Kenneth City. He also helped to make everything perfect at the time of our closing. When we came down early in 1958 to pick out a building site and select a model home, Michael decided to stay on in Florida until the house was completed (Nick was still in the Army in Germany). 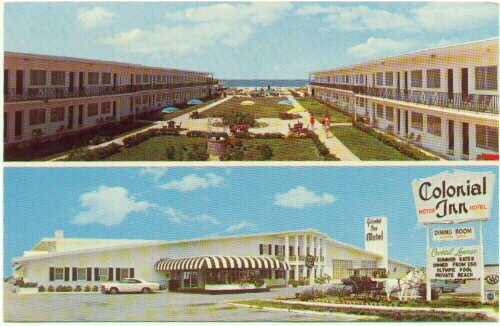 Michael got a job as a lifeguard at the Colonial Inn at St. Petersburg Beach, and as it happened, Sidney Colen and his wife and two children were vacationing there. Michael got to know Sidney Colen's children because he had to supervise all the children at the pool. He did very well there. All the children loved him because of his strict discipline. After arriving in Florida, Michael and I agreed that I would take over his 1956 black and white Ford. It was in perfect condition, and we drove that car until it had over 110,000 miles on its odometer. I was often stopped by people who wanted to buy the car. I finally traded it in on my first new car, a 1966 Ford.